The Amalfi Coast is certainly the romantic pulse of Italy; seducing visitors with its famous coastlines and the lemon-tree lined hilltop towns of Positano, Amalfi and Ravello. The road connecting the coast is windy and narrow, but absolutely magnificent. The kind of Italian magic you won't find anywhere else, and as Sophia Loren said (like a true Italian) "Everything you see I owe to pasta." you will get the tenth night free. I’m only including one hotel here, because really – this is the place you want to be. Positioned on Amalfi Drive, in the centre of the village of Positano, is the incredibly elegant La Sirenuse. The rooms and terraces sit 70 metres above the sea, and are an unbeatable oasis of peace and silence. The view is undoubtedly the most impressive in all of Positano, with front row seats to the cascading cliff of colour – we all have come to see. The Sersale family, who once used this palazzo as their private seaside retreat, owns the residence; it only takes a moment inside to fall in love with the passion and authentic Italian taste of this family. “The majolica-tiled rooms are filled with museum-worthy antiques, hand-picked mostly by patriarch Franco Sersale. Da Adolfo is the perfect Italian-summer experience. You must board a small boat to the very tiny Laurito beach, a relaxed ten-minute chug from Positano. Adolfo is a coastal-chic beach cabana offering a relaxed selection of local specialities - complemented by pitchers of chilled vino. And when I say relaxed dining, I’m talking barefoot waiters, chalkboard menus and a bed to enjoy your post-meal siesta. The food is prepared with locally sourced produce and a whole-lot of Italian lovin’. Opened in 2004, Next2 combines the two great passions that have always inspired Tanina Vanacore: her long-standing devotion to fine food and cooking, which she lovingly passed on to her daughter Carmela, who now runs the restaurant; and her predilection for simplicity and elegance of design. Franco’s Bar is a chic al fresco bar at the very top of Positano, and without doubt, this is where you want to be for sunset. The drinks menu, curated by Le Sirenuse’s head barman Robert Wimmer, pays homage to a golden age of fine spirits and French champagne, a time when cultured travels could distinguish an Old Fashioned from their French 75. The menu offers a classic selection of rosè, prosecco and a dry martini, with an elevated selection including Krug a Bicchiere, Dom Pérignon and milliésimé. 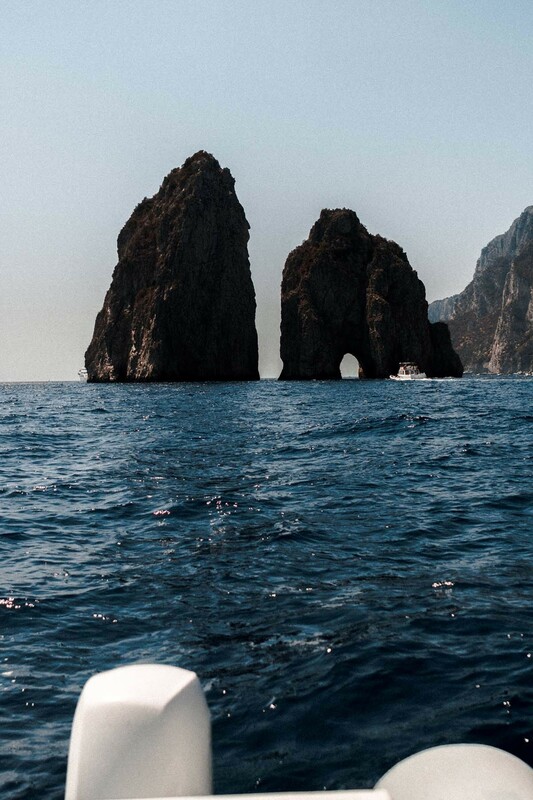 Capri is an Island off the Italian Bay of Naples, stamped by the iconic Blue Grotto. 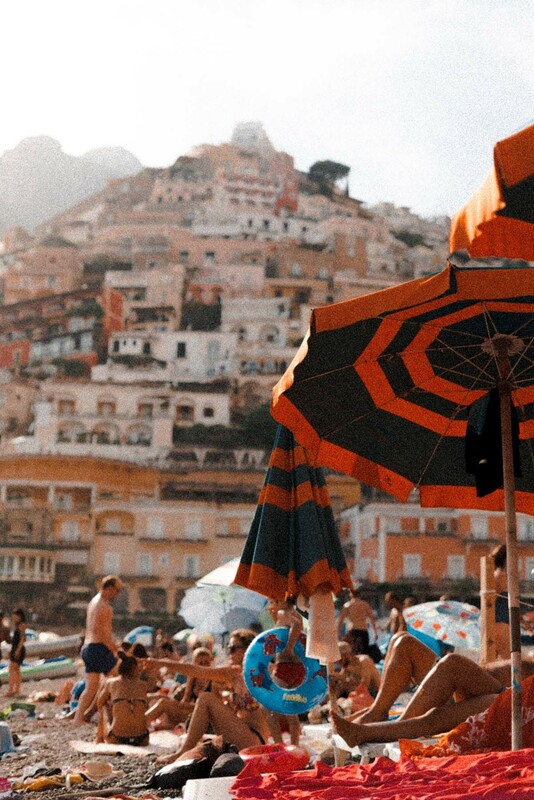 While not quite on the Amalfi Coast, your Italian vacation would not be complete without indulging in the charm yourself. On the Island of Capri, looking over the Gulf of Naples and a short boat-ride to the Blue Grotto is the very chic JK Place. Besides the obvious charm, the real pulse lies within a feeling of seclusion and calm, yet feeling right amidst it all. Surrounded by the white sand of Capri, and the glistening blue coastline, will leave you longing to stay forever. Wandering around the property feels like a scene from an old Fellini film; Italy just as you imagined it. Rows of lemon trees, alongside a neat row of white wooden day beds overlooking the emotive Mediterranean Sea. You will spend your day dining on the terrace, sipping whisky at the poolside bar and soaking up the steam at the opulent in-house spa. Nestled between the lemon-trees in an alfresco setting is the very charming Da Paolino. An ongoing tradition, generation to generation, the De Martino family has been creating locally sourced, fresh produce for decades. I recommend a selection of seafood antipasti, accompanied by the catch of the day – when the seafood is this fresh – it would be rude not to! This is the place to be in Capri, enjoy a Bellini al fresco style, while you’re serenaded by grand-pianist in the corner. Quisi is the perfect spot for people watching, while being drenched by the summer sun. The bar is apart of the renowned Quisisana Hotel. 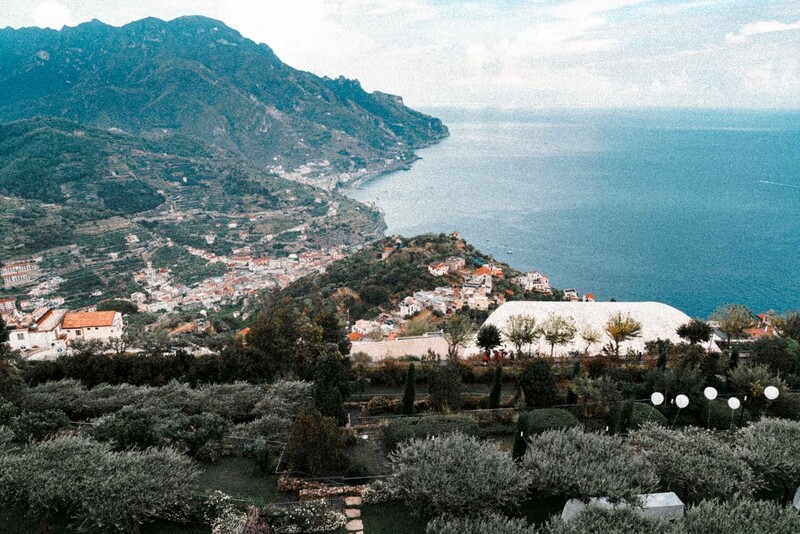 The only way to describe the magic of Ravello, is a place caught between the earth and the sky. Hidden high in the mountains, overlooking the entire Amalfi coast cascading below you. Set on a cliff edge 1,000ft above sea level, Belmond Hotel Caruso is your private balcony over the Amalfi Coast; a heavenly retreat between sea and sky. This former 11th-century palace boasts all the worldly luxuries anyone could desire. Marbled hallways lead to rooms brimming with antiques and paintings by old masters. Cascading down the mountain, past lemon groves and olive trees, is Ravello, the mesmerising ‘city of music’. Opening in 1934, when Nonna Orsola ran the kitchen has evolved into a renowned gastronomic experience, fusing simple, quality ingredients with a complexity that can only be achieved with Italian roots. The restaurant incorporates biodynamic ingredients, picked fresh from their garden, which cascades across the hotels terraces. Sitting high on the Mediterranean, with a dramatic view of the Amalfi Coast in the distance, is right where you want to be.